Emile Berliner (May 20, 1851 – August 3, 1929), originally Emil Berliner, was a German-born American inventor. He is best known for inventing the flat disc record (called a "gramophone record" in British and American English) and the Gramophone. He founded the United States Gramophone Company in 1894, The Gramophone Company in London, England, in 1897, Deutsche Grammophon in Hanover, Germany, in 1898, Berliner Gram-o-phone Company of Canada in Montreal in 1899 (chartered in 1904), and Victor Talking Machine Company in 1901 with Eldridge Johnson. Berliner was born in Hanover, Germany, in 1851 into a Jewish merchant family. Though raised Jewish, he later became an agnostic. He completed an apprenticeship to become a merchant, as was family tradition. While his real hobby was invention, he worked as an accountant to make ends meet. To avoid being drafted for the Franco-Prussian War, Berliner migrated to the United States of America in 1870 with a friend of his father's, in whose shop he worked in Washington, D.C. He moved to New York and, living off temporary work, such as doing the paper route and cleaning bottles, he studied physics at night at the Cooper Union Institute. After some time working in a livery stable, he became interested in the new audio technology of the telephone and phonograph, and invented an improved telephone transmitter (one of the first type of microphones). The patent was acquired by the Bell Telephone Company (see The Telephone Cases). In America, Thomas Edison and Berliner fought a long legal battle over the patent rights. But on February 27, 1901 the United States Court of Appeal declared the patent void and awarded Edison full rights to the invention, stating "Edison preceded Berliner in the transmission of speech...The use of carbon in a transmitter is, beyond controversy, the invention of Edison" and the Berliner patent was ruled invalid. Berliner subsequently moved to Boston in 1877 and worked for Bell Telephone until 1883, when he returned to Washington and established himself as a private researcher. Emile Berliner became a United States citizen in 1881. Berliner also invented what was probably the first radial aircraft engine (1908), a helicopter (1919), and acoustical tiles (1920s). In 1886 Berliner began experimenting with methods of sound recording. He was granted his first patent for what he called the "Gramophone" in 1887. The patent described recording sound using horizontal modulation of a stylus as it traced a line on a rotating cylindrical surface coated with an unresisting opaque material such as lampblack, subsequently fixed with varnish and used to photoengrave a corresponding groove into the surface of a metal playback cylinder. In practice, Berliner opted for the disc format, which made the photoengraving step much less difficult and offered the prospect of making multiple copies of the result by some simpler process such as electrotyping, molding or stamping. In 1888 Berliner was using a more direct recording method, in which the stylus traced a line through a very thin coating of wax on a zinc disc, which was then etched in acid to convert the line of bared metal into a playable groove. By 1890 a Berliner licensee in Germany was manufacturing a toy Gramophone and five-inch hard rubber discs (stamped-out replicas of etched zinc master discs), but because key US patents were still pending they were sold only in Europe. Berliner meant his Gramophone to be more than a mere toy, and in 1894 he persuaded a group of businessmen to invest $25,000, with which he started the United States Gramophone Company. He began marketing seven-inch records and a more substantial Gramophone, which was, however, still hand-propelled like the smaller toy machine. The difficulty in using early hand-driven Gramophones was getting the turntable to rotate at an acceptably steady speed while playing a disc. Engineer Eldridge R. Johnson, the owner of a small machine shop in Camden, New Jersey, assisted Berliner in developing a suitable low-cost wind-up spring motor for the Gramophone and became Berliner's manufacturer. 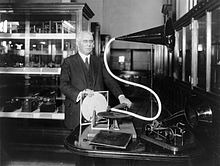 Berliner gave Frank Seaman the exclusive sales rights in the US, but after disagreements Seaman began selling his own version of the Gramophone, as well as unauthorized copies of Berliner's records, and Berliner was legally barred from selling his own products. The US Berliner Gramophone Company shut down in mid-1900 and Berliner moved to Canada. Following various legal maneuvers, the Victor Talking Machine Company was officially founded by Eldridge Johnson in 1901 and the trade name "Gramophone" was completely and permanently abandoned in the US, although its use continued elsewhere. The Berliner Gramophone Co. of Canada was chartered on 8 April 1904 and reorganized as the Berliner Gramophone Co. in 1909 in Montreal's district Saint Henri. The Gramophone was presented as an apparatus for making permanent records of the human voice or other sounds, including music of all kinds and for reproducing the same at any time thereafter as often as desired. The records were of hard rubber, solid metal or other indestructible material and could therefore be handled without fear of breaking or injuring them. The sound records were grooves of even depth but of varying direction, as apposed to those of straight lines and various depths in the Phonograph and Graphophone. These records could be multiplied at will to any extent, and each copy would sound precisely like the original. It was based on the Leon Scott Phonautograph, which was invented nearly forty years before, and which traced sound as curvilinear lines upon the smoked surface of a brass cylinder by means of a diaphragm with a stylus attached to its center. Early in 1877, or six months before the discovery of the phonograph principle by indenting tin-foil or wax, Charles Cros, of Paris, had conceived and placed on file the theory that if the curvilinear record of a Scott Phonautograph be photo-engraved, and such an engraving be made to act again on a stylus attached to a diaphragm, the original sound would be reproduced with absolute accuracy. This was the first conception of a spund-reproducing machine. Cros, however, did not put this idea into practical operation, presumably on account of the many technical difficulties which had to be overcome in order to accomplish it. Emile Berliner undertook to reproduce the human voice on a similar principle, and after much study and experimenting, secured fundamental patents covering the general process and its essential details. In his machine, which he called The Gramophone (from phonautogram or phonautographic record) the voice was first traced in curvilinear lines as in the Scott machine, but on a metal plate covered with a very delicate layer of fatty etching ground, and the lines were then “etched” in to the metal plate by immersing the same in acid. From this faithfully etched record the voice could readily be reproduced, and copied at will by electrotyping or other modes of multiplying. "Future generations will be able to condense into the brief space of twenty minutes the tone pictures of a lifetime - five minutes of childish prattle, five moments embalming the last feeble utterrances from the death-bed. Will this not seem like holding veritable communion with immortality?" Berliner's other inventions include a new type of loom for mass-production of cloth; an acoustic tile; and an early version of the helicopter. According to a July 1, 1909, report in The New York Times, a helicopter built by Berliner and J. Newton Williams of Derby, Connecticut, had lifted its operator (Williams) "from the ground on three occasions" at Berliner's laboratory in the Brightwood neighborhood of Washington, D.C. Between 1907 and 1926, Berliner dedicated himself to improving the technologies of vertical flight through the development of a light-weight rotary engine, which he improved upon throughout the 1910s and 1920s. With R.S. Moore, also a Scientist and Inventor, as his chief assistant, Berliner obtained automobile engines from the Adams Company in Dubuque Iowa, manufacturer of the Adams-Farwell automobile. This car used air cooled three or five cylinder rotary engines which were developed in-house by Fay Oliver Farwell (1859–1935). Berliner and Farwell adapted them for use in perfecting "machines" produced for vertical flight. His realizations allowed him to move away from the heavy in-line engines to lighter rotary models, which led to the invention of a 6-hp rotary engine for the improvement of vertical flight. It was these experiments that led to the formal creation of the Gyro Motor Company in 1909. And it was the creation of the 6-hp rotary engine that initiated the use of rotary engines in aviation. 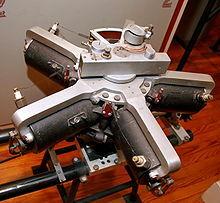 The Gyro Motor Company manufactured these and other improved versions of the Gyro Engine between 1909 and roughly 1926. The building used for these operations exists at 774 Girard Street, NW, Washington DC, where its principal facade is in the Fairmont-Girard alleyway. By 1910, continuing to advance vertical flight, Berliner experimented with the use of a vertically mounted tail rotor to counteract torque on his single main rotor design. And it was this configuration that led to the mechanical development of practical helicopters of the 1940s. When the Gyro Motor Company opened, Spencer Heath (1876–1963), a mechanical engineer (among other things), became the manager. Heath was connected with the American Propeller Company, also a manufacturer of aeronautical related mechanisms and products in Baltimore, Maryland. Both R.S. Moore, Designer and Engineer, and Joseph Sanders (1877–1944), inventor, engineer, and manufacturer, were involved in the original operations of the company. Berliner was president of the newly founded Gyro Motor Company and much of his time was spent dealing with business operations. On July 16, 1922, Berliner and his son, Henry, demonstrated a working helicopter for the United States Army. Henry became disillusioned with helicopters in 1925, and in 1926 founded the Berliner Aircraft Company, which merged to become Berliner-Joyce Aircraft in 1929. Berliner, who suffered a nervous breakdown in 1914, was also active in advocating improvements in public health and sanitation. He also advocated for women's equality and, in 1908, established the scholarship program, Sarah Berliner Research Fellowship, in honor of his mother. Berliner also supported and advocated Zionism. Berliner was awarded the Franklin Institute's John Scott Medal in 1897, and later the Elliott Cresson Medal in 1913 and the Franklin Medal in 1929. On August 3, 1929, Berliner died of a heart attack at his home at the Wardman Park Hotel in Washington D.C., at the age of 78. He is buried in Rock Creek Cemetery in Washington, D.C., alongside his wife and a son. Muddy Jim and other rhymes: 12 illustrated health jingles for children, 1919, Jim Publication Company. ^ a b Library of Congress. "Emile Berliner and the Birth of the Recording Industry: The Gramophone". Retrieved 2017-01-19. ^ "Concerning Emile Berliner, The Jew TO BE a Jew may mean one of several identities. For example, the Jew, Emile Berliner, the late inventor, called himself agnostic." B'nai B'rith, The National Jewish monthly: Volume 43; Volume 43. ^ "In 1899, Berliner wrote a book, Conclusions, that speaks of his agnostic ideas on religion and philosophy." Seymour Brody, Jewish heroes & heroines of America: 151 true stories of Jewish American heroism (2003), page 119. ^ "Emil Berliner: Google würdigt den Schallplatten-Erfinder – NETZWELT". Netzwelt.de. Retrieved 2013-07-25. ^ "Emil Berliners 160. Geburtstag: Google Doodle für den Erfinder der Schallplatte – Kultur". Stern.De. 2011-05-20. Retrieved 2013-07-25. ^ "Engineering and Technology History Wiki: Telephones – Variable Resistance Transmitters". Retrieved 2018-05-10. ^ Berliner, E., Berliner Gramophone Co & Berliner Gramophone Company. (1871) Gramophone: invented by Emile Berliner, "reproducing the human voice". Berliner Gramophone Company, Philadelphia. [Image] Retrieved from the Library of Congress, https://www.loc.gov/item/berl0190/. ^ "Berliner Helicopter, Model 1924". National Air and Space Museum. 1998. Retrieved 17 June 2010. ^ "In the Public Eye". Technology Review. 23: 60–1. January 1921. ^ a b Frank, Caso (June 8, 2011). "Emile Berliner (1851-1929)". Immigrant Entrepreneurship. German Historical Institute. Retrieved January 12, 2018. ^ Wilson, Scott (2016). Resting Places: The Burial Sites of More Than 14,000 Famous Persons, 3d ed (3 ed.). McFarland. p. 59. ISBN 978-1-476-62599-7. Harvey, Wells F. (October 1912). "Dr. Berliner, Master Inventor". The World's Work: A History of Our Time. XXIV: 673–675. Retrieved 2009-07-10. Kurinsky, Samuel. "Emile Berliner – An Unheralded Genius: Part I – The Early Years". Fact Paper 27-I. Hebrew History Foundation. Retrieved 2015-05-06. Kurinsky, Samuel. "Emile Berliner – An Unheralded Genius: Part II – The Later Years". Fact Paper 27-II. Hebrew History Foundation. Retrieved 2015-05-06. Kurinsky, Samuel. "The Telephone". Fact Paper 2. Hebrew History Foundation. Retrieved 2015-05-06. Wile, Frederic William (1974). Emile Berliner Maker of the Microphone. Ayer Company. ISBN 978-0-405-06062-5. Wikisource has the text of the 1900 Appletons' Cyclopædia of American Biography article Berliner, Emile. Wikimedia Commons has media related to Emile Berliner. Berliner, E., Berliner Gramophone Co & Berliner Gramophone Company. (1871) Gramophone: invented by Emile Berliner, "reproducing the human voice". Berliner Gramophone Company, Philadelphia. [Image] Retrieved from the Library of Congress, https://www.loc.gov/item/berl0190/. This page was last edited on 21 April 2019, at 04:51 (UTC).